Alvaro Ramirez Carreno recently received the Mary Sutherland award for a student studying Forestry at the Annual NZ Institute of Forestry (NZIF) Conference, held in Auckland in May 2011. Alvaro started with Interpine working within our field inventory operations and has subsequently continued on to study at the Waiariki Institute of Technology in Forestry Management. Alvaro continues to work with our team here at Interpine when free from his full time study. 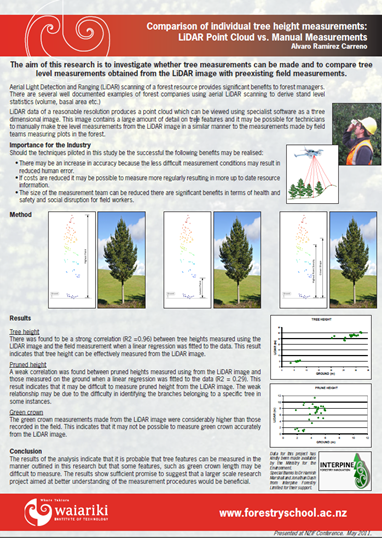 As part of his research work, he has worked closely with Dr Hamish Marshall and Jonathan Dash here to present a poster at the NZIF conference looking at comparison of individual tree height measurements: LiDAR vs. manual ground measurement. The results of Alvaro’s analysis indicate that it is probable that tree features can be measured in the manner outlined in this research but that some features, such as green crown length may be difficult to measure. The results show sufficient promise to suggest that a larger scale research project aimed at better understanding of the measurement procedures would be beneficial. Something that Interpine continues in its commercial research work with LiDAR.